I try my best to keep this site from being too diary or journal-like, but today I'm going to be intentional in breaking those walls down. This weekend was an awesome weekend and I feel like it'd be a loss if I didn't describe it. But hey, I'm a geek, so I'm going to relate this to geekdom first of all. As you may know, I love gaming (stop the press!). But even before that, I'd say first and foremost, I love story and through gaming I'm allowed to be whisked away on adventures and fantastical journeys. Which a lot of the time, is why I like single player games more than competitive multiplayer. But there is a caveat to that statement. You see, the sub-genre or option that I enjoy even more than a single player story game is a game that has a co-op campaign. Being allowed to go on an adventure with my friends trumps going on an adventure by myself, which is why I love co-op more than competitive multiplayer — I'd rather play alongside friends than against them. It has this great sense of camaraderie and community. [Note: geek element over, you'll see how this all relates]. It was quite an eventful yet busy time this past weekend. On Saturday evening, I hosted a party for a pair of friends birthdays. Usually we keep the shindigs small as we're a close-knit group of friends who grew up at my old church (TCMC) together. This time was nice though as we had a few friends over who didn't grow up or go to TCMC, but were friends in general. Despite being rained out later in the evening (we BBQ'd and sat around outside), it was a great time of celebrating and laughing. Two of my friends are getting married next month, so there was a lot of teasing and joking with them. I think what brought me the most joy was just seeing the friends of friends interact with each other. I don't know why, but anytime this ever happened in the past (it happened more in university than after it seems) it always brought me joy. I guess it's just that sense of community that is beautiful and yet intriguing. In the big picture, would friends of friends ever meet each other were it not for a core group? Sunday was also a great day at TCMC as the church celebrated its 30th anniversary. Both friends, former pastors and members were invited for this celebration of memories. Because it was a morning service, I of course attended in typical Jeff Lam-style (ie. arriving sleepy, late and missing 80% of the service). But from the sound of things, it seems I caught all the good parts (eg. the slideshow, the children's presentation, the photo-takings and the catered lunch). I guess what made the event special, more so than the official or formal stuff, was everything after. It was just awesome sitting down with people afterward, connecting with all my former pastors and friends who haven't been around for a while. It was interesting hearing all the stories and where all these people are at in their lives; planting churches, ministering to the needy, going away for school, and so forth. After the event and a 10-minute breather at home, I headed downtown to FT's evening service. I left home early, fearing that protesters/anarchists/hoodlums-in-general might cause a delay on the subway, but thankfully they did not. After a passionate sermon delivered by young Kevin Makins, a bunch of us headed over to Nirvana to grab a bite. It was funny because almost as soon as service was over, a heavy thunderstorm poured down and irritated all those without umbrellas, raincoats or some form of cover (eg. me). So me and a few friends decided we'd make a run for it, across about 3 blocks in the pouring rain to get to the restaurant. I took off my flip-flops and away we went. Within mere seconds, we were soaked. And I don't know why, but at that exact moment I felt this overwhelming sense of joy more so than any other moment this past while. 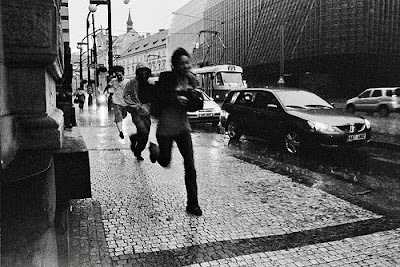 And I can't explain, I've ran through rain with friends before, so I don't know if that was it. Perhaps it was just the buildup of joy over the course of the weekend, I don't know. But for whatever reason, it felt surreal and in a strange way, tranquil, as if the streets were only us. Then the soundtrack in my head queued up Mae's "A Melody, the Memory". It completed the moment. The time spent at Nirvana was good as well, and again, it was with friends connecting with new friends and connecting with other new friends. I'm glad that the pastor at FT has allowed me to become the hospitality team leader. At first it seemed a bit daunting, and in someways it still is, but it's never felt impossible or overwhelming. A lot of people have felt encouraged which in turn encourages me; that and I've been blessed with a great team. I've been trying to be more intentional and purposeful about community and connecting people with other people. So at 3 in the morning what do I realize? That God has really surrounded me with some awesome people and that he's continually introducing ridiculously great people into my life. He's really shown me over the past few months how good community can be. I think really that's what Jesus was encouraging us to do when he told us to one love and other. And what is a network of love but a community. Felt the love and joy on the Saturday night and Sunday as well. Community really is beautiful!